December, 1902. Sun. 28. 15º Cloudy. S. wind. Snowed an inch or more, evg. Church morn. & evg. Mon. 29. 10º Clear & beautiful; S.W. gtle. - Colder P.M. & snow-squally N.W. 3º evg. - abstracting. Said home after supper. Tues. 30. O. clear. West. Cold A.M. - 16º at noon. fair to-day. Very busy [illegible] - Lunch at model. & home to supper 7, & said home. - Clara came up to attend oyster supper at Ed. Fourt's, & ride. Wed. 31. 25º clear. S.W. 38º P.M. Harriet went down with Clara to school. Very busy; C. in P.M.; office evg. Jan. 1. 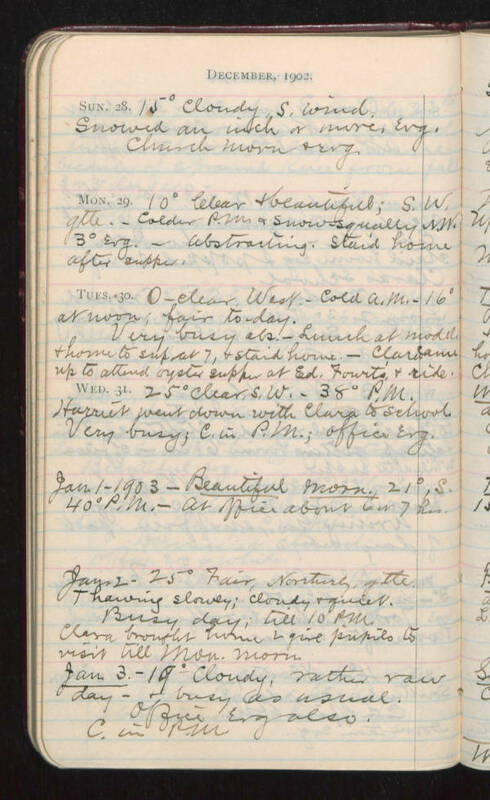 1903 - Beautiful morn., 21º, S. 40º P.M. - At office about 6 or 7 hrs. Jan. 2. 25º Fair. Northerly, gtle. Thawing slowly; cloudy & quiet. Busy day; till 10 PM. Clara brought home & give pupils to visit till Mon. morn. Jan. 3. - 19º Cloudy. rather raw day - & busy as usual. Office evg also. C. in P.M.